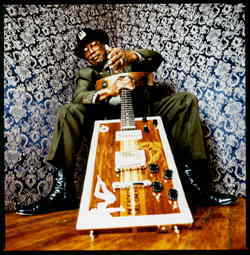 Bo Diddley is the originator. Born in 1928, he is widely acknowledged as the father of rock n’ roll, a grandfather to punk, and has been copied more times than any recorded musician this side of Clyde Stubblefield. Like Stubblefield, Diddley has been elected into the Rock and Roll Hall of Fame, and recently received a Lifetime Achievement Award from the Grammies. His signature rhythm, the “Bo Diddley Beat” has spurred generations of rockers, from Buddy Holly, The Who, Bruce Springsteen, U2, and Guns n’ Roses, to the Rolling Stones, Muddy Waters, Aerosmith, Bob Seger, the Animals and, of course, George Thorogood. In 2003, Diddley was honored by US Representative John Conyers, Jr., who stated that Bo Diddley was “one of the true pioneers of rock and roll who has influenced generations,” and he’s been instrumental in helping to organize benefits for Katrina victims in Mississippi. Some believe the name Bo Diddley comes from an old, southern black slang phrase meaning “nothing at all,” as in, “he ain’t bo diddley.” Others believe it may have been his nickname as a Golden Gloves boxer. Another story links the name to the “diddley bow,” a one-stringed instrument that consisted of a nail and some bailing wire attached to your front porch; A common start for many players on the old south. All that acclaim, yet Bo don’t receive Diddley in royalties from any of his major-label recordings. But he ain’t gone yet! A career that spans more than 50 years and nearly three dozen records proves Bo knows more than Diddley – Maximum Ink sat down with Diddley for this exclusive interview, just before his 75th Birthday party in Chicago. MAXIMUM INK: What’s the history behind your square guitar, especially the first one, Big B? BO DIDDLEY: That was the name I called it then, I later re-named it the Mean Machine, [Laughing] An Australian fellow built the new one for me. The first one was built by Gretch. I only have two guitars left, all the rest are in the Hard Rock Café’s around the world. There’s nothing much to say about them, they are just guitars. MAX INK: When you put “Bo Diddley” on wax for the first time, what was it that influenced you to record it? A woman? DIDDLEY: No, no, no, no. I was trying to play a song by Gene Autry, and stumbled upon that. I think it was his first recording, “Jingle-Jangle-Jingle.” It was an accident, really, and that just came out. MAX INK: Tell me about the 708 Club. DIDDLEY: That’s where I started at, really. Chicago, about a block away my house, I was raised up there. I was paying $18 a week for a room with a hotplate. It helped to pay the bills; we would play on street corners, wherever I could get a hold of a nickel and dime. MAX INK: Any words about your 1996 release “A Man Amongst Men”? DIDDLEY: It was a very good thing, but it didn’t get pushed that much. I don’t know what happened to Atlantic Records, but it was like I was something of a tax write-off. It was on Code Blue, the company under the Atlantic “umbrella,” as they call it. MAX INK: You were the first African-American to appear on the Ed Sullivan Show. What really happened that day on Ed Sullivan, where you played “Bo Diddley” instead of “16 Tons”? DIDDLEY: He told me, after they made the mistake, that I [would] live with that mistake that they made for years. I finally told somebody about it, how it was, and what happened. His writers screwed up. I only did what the papers said. My name is Bo Diddley, and the song was “Bo Diddley,” they got it screwed up. MAX INK: They wanted you to play “16 Tons”? DIDDLEY: They had, “Bo Diddley-16 Tons,” That means I was supposed to do two songs, and they wanted me to do one song, Tennessee Ernie (Ford)’s “16 Tons,” and that was a crock of crap. MAX INK: Who are your influences? DIDDLEY: I have no influences. Bo Diddley will bring the roots of music, along with Alvin Youngblood Heart and Ruthie Foster, to Sangamon Auditorium in Springfield, IL, Oct. 17; the Overture Center for the Arts in Madison, Oct. 18; the Peoria Civic Center, in Peoria, IL, Oct. 19; the Hemmens Cultural Center in Elgin, IL, Oct. 20, and to Emens Auditorium, in Muncie, IN, Oct. 21.